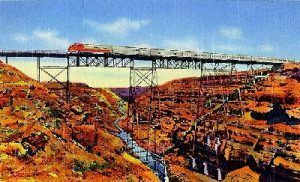 Canyon Diablo, Arizona originated as a railroad town in 1880 when construction was halted until a bridge could be built over the canyon. A further delay was caused by financial difficulties and it wasn’t until 1890 that the railroad bridge was completed. The canyon had earlier been given its name by a soldier named Lieutenant Amiel Whipple in 1853 when it presented such an obstacle to his thirty-fifth parallel survey party. Having to go miles out of their way to get across, he appropriately named it Devil’s Canyon. When the town was born, it took the canyon’s name, which ended up being extremely appropriate for the reputation that the town would soon earn. 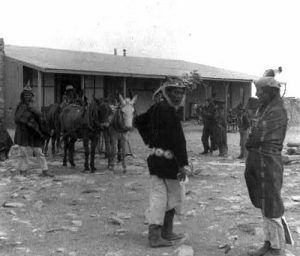 Canyon Diablo Trading Post-1903. Click for prints, downloads and products. There being no law enforcement in the settlement, it quickly became a wild and lawless place as drifters, gamblers, and outlaws made their way to town. With the closest law enforcement being some 100 miles away, the settlement earned a reputation of being meaner thanTombstone and Dodge City combined, with many of it “citizens” winding up in the local cemetery. The saloons, gambling dens and brothels never closed, running 24 hours a day. The town comprised mostly of shacks with two lines of buildings facing each other across the rocky road on the north side of the railroad right-of-way. The “street,” aptly referred to as Hell Street, included fourteen saloons, ten gambling houses, four brothels and two dance halls. Wedged between these businesses were a couple of eating counters, a grocery and a dry goods store. With a population of nearly 2,000, a regular stage operated between Flagstaff and Canyon Diablo that ended up being the target of many robberies. 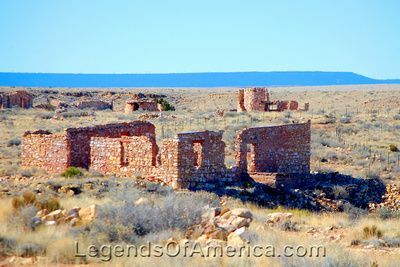 When Canyon Diablo finally got a peace officer, the first one pinned on a badge at 3:00 p.m. and was laid out for burial at 8:00 p.m. Five more foolish men also tried their hands at marshalling in this God forsaken town. None of them lasted more than a month in the position before they too were killed. Boot Hill cemetery filled up fast, where at one time 35 graves could be seen with wooden markers and stone covered mounds. All are gone today, but that of Herman Wolf, a trader who passed away in 1899 and the only one to have died peacefully. Once the railroad bridge was built over the canyon, the town began to die. Still wild, the remaining residents requested that the army take over law enforcement, but before they arrived the town was pretty much dried up and the lawless drifters had moved on. Later when Route 66 came through the area, another town called Two Guns sprouted up just south of Canyon Diablo. Catering to the travelers of the Mother Road, Two Guns was simply a few buildings including a gas station and roadhouse. Two Guns is also a ghost town that died with the advent of I-40. Today, several foundations along with the grave of Herman Wolf, can be still be seen at Canyon Diablo, along with the original limestone footings for the railroad trestle, which has since been replaced with a steel arch span. Canyon Diablo is north of I-40 between Meteor City, and Flagstaff, Arizona. Take the Two Guns Exit (#230). The road to Canyon Diablo is immediately right of the old gas station in Two Guns. This is a rough road and best traveled with a four wheel drive; however, if conditions are good, and you take your time, it could be taken in a regular car. The road is very rocky, so caution should be taken with any low seated vehicle. Beyond Canyon Diablo, Route 66 continues westward.